Though clearly not in the same capacity or pricing realm as most drives in this line-up, we can still evaluate the speed of the 2big Dock against other fast devices. It's important to have really solid throughput due to the size of the drive, of course. Starting with a simple sequential read and write test, we can get a feel for the drive's performance in a best-case scenario. 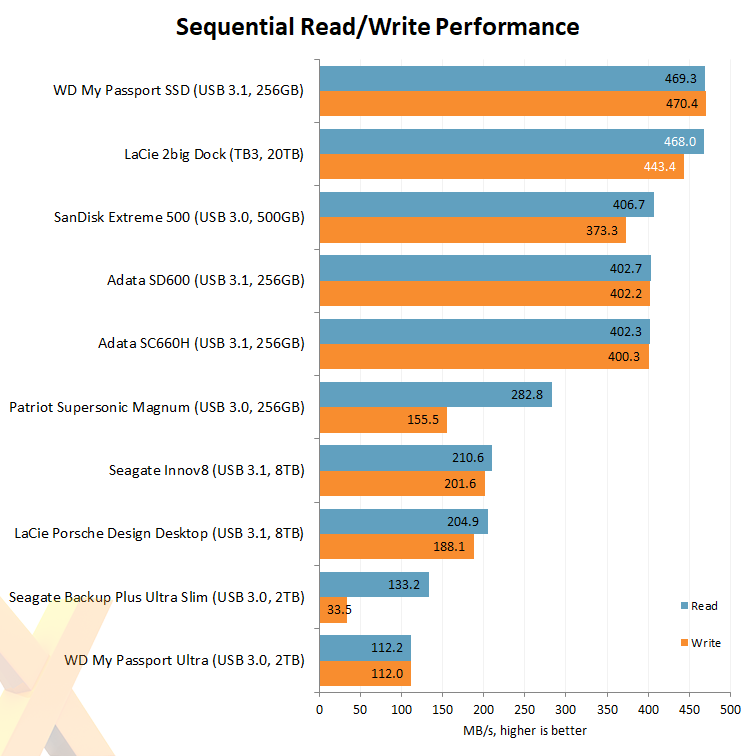 Raiding a couple of 10TB drives introduces really solid sequential reading and writing speeds, but do be aware of the risk to data should one of the drives go down - there's no redundancy in this mode. Reformatting the pair into Raid 1 reduces the read and write speeds to 247MB/s and 234MB/s, respectively. Our second test involves two scenarios; copying across a folder containing large files such as ISOs; and copying across a program folder full of various small files. Again, the virtues of Raid are evident, and the Thunderbolt 3 conduit, offering up to 40Gb/s of bandwidth, has ample room with which to let the drives max out their performance. 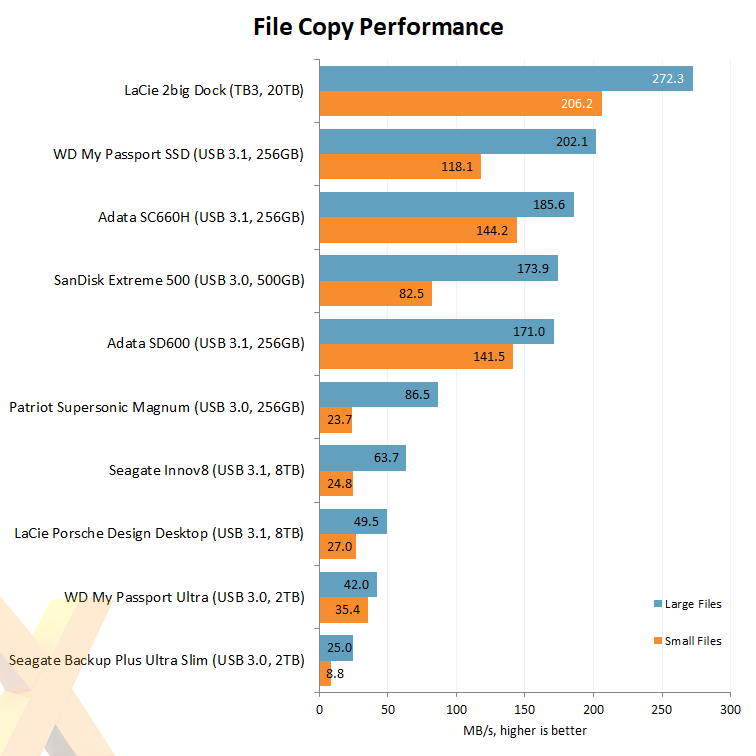 We also copied over a 53GB folder full of large files, imitating the kinds of workloads professional users may indulge in, and the LaCie copied over from a Samsung 960 Pro 500GB drive in just a shade over two minutes. Writing back to the SSD in a non-cached state took a hair under two minutes, translating to around 400MB/s in both directions. Ingesting content is also an important consideration for the 2big Dock. To that end, we connected a SanDisk Extreme 500 external SSD and recorded large-file read and write transfer speeds of 394MB/s and 381MB/s, respectively. ...a doddle to use and able to transfer large files at around 400MB/s. Users wanting fast access to a repository of data can either go down the traditional NAS route or, if using just one machine, opt for an external enclosure housing fast drives. This is where the LaCie 2big Dock comes into play. Outfitted with 20TB split over two Seagate IronWolf Pro drives and connected to the system via either Thunderbolt 3 or USB 3.1 Gen 1, the attractive storage solution, backed by a five-year warranty, is a doddle to use and able to transfer large files at around 400MB/s. The £1,149 price tag, though feeling expensive to a mainstream consumer, is at the lower end of the commercial scale for 20TB of storage, so for those digital content creators who deal with massive files on a daily basis, there's something nice about having a box hold massive amounts of data simply and stylishly. The LaCie 2big Dock Thunderbolt 3 20TB is available to purchase from Amazon. Those HDDs are 700 quid at retail, so being generous and saying they pay just as much, that means they're charging 450 quid for a 2 drive enclosure. Doesn't look great to me, looks ugly, typicallyover engineered. Is about £200 after taking off the drive case. 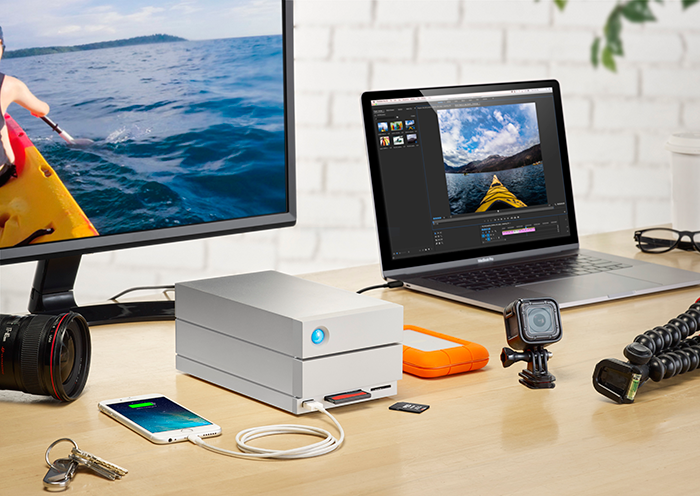 The LaCie includes more Thunderbolt bots for daisy chaining, USB3.1 and USBC, as well as a CF and SD reader in one box. This is (as the review says) not a product aimed at the general consumer, but those engaged in semi professional film making. Being able to take an SD card out of a camera at the end of a shot and back it up immediately is incredibly useful. That's a pretty unfortunate name though.